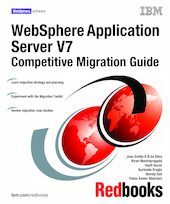 This IBM® Redbooks® publication helps you plan and execute the migration of J2EE applications developed for Oracle WebLogic Server, JBoss, GlassFish, and Apache Tomcat, so that they run on WebSphere® Application Server V7. This book provides detailed information to plan migrations, suggested approaches for developing portable applications, and migration working examples for each of the platforms from which we migrated. It is not our intention to provide a feature-by-feature comparison of these application servers versus WebSphere Application Server V7, or to argue the relative merits of the products, but to produce practical technical advice for developers who have to migrate applications from these vendors to WebSphere Application Server V7. The book is intended as a migration guide for IT specialists who are working on migrating applications written for other application servers to WebSphere Application Server V7.